The Turkish account of the murder of Khashoggi given by President Erdogan is true, in every detail. Audio and video evidence exists and has been widely shared with world intelligence agencies, including the US, UK, Russia and Germany, and others which have a relationship with Turkey or are seen as influential. That is why, despite their desperate desire to do so, no Western country has been able to maintain support for Crown Prince Mohammed Bin Salman. I have not seen the video from inside the consulate, but have been shown stills which may be from a video. The most important thing to say is that they are not from a fixed position camera and appear at first sight consistent with the idea they are taken by a device brought in by the victim. I was only shown them briefly. I have not heard the audio recording. There are many things to learn from the gruesome murder other than the justified outrage at the event itself. It opens a window on the truly horrible world of the extremely powerful and wealthy. The first thing to say is that the current Saudi explanation, that this was an intended interrogation and abduction gone wrong, though untrue, does have one thing going for it. It is their regular practice. The Saudis have for years been abducting dissidents abroad and returning them to the Kingdom to be secretly killed. The BBC World Service often contains little pockets of decent journalism not reflected in its main news outlets, and here from August 2017 is a little noticed piece on the abduction and “disappearance” of three other senior Saudis between 2015-17. Interestingly, while the piece was updated this month, it was not to include the obvious link to the Khashoggi case. The key point is that European authorities turned a completely blind eye to the abductions in that BBC report, even when performed on European soil and involving physical force. The Saudi regime was really doing very little different in the Khashoggi case. In fact, inside Saudi Arabia, Khashoggi was a less senior and important figure than those other three abducted then killed, about whom nobody kicked up any fuss, even though the truth was readily available. Mohammed Bin Salman appears to have made two important miscalculations: he misread Erdogan and he underestimated the difference which Khashoggi’s position as a Washington Post journalist made to political pressure on Western governments. Khashoggi should not himself be whitewashed. He had a long term professional association with the Saudi security services which put him on the side of prolific torturers and killers for decades. That does not in any sense justify his killing. But it is right to be deeply sceptical of the democratic credentials of Saudis who were in with the regime and have become vocal for freedom and democracy only after being marginalised by Mohammed Bin Salman’s ruthless consolidation of power (which built on a pre-existing trend). The same scepticism is true many times over when related to CIA Director Gina Haspel, who personally supervised torture in the CIA torture and extraordinary rendition programme. Haspel was sent urgently to Ankara by Donald Trump to attempt to deflect Erdogan from any direct accusation of Mohammed Bin Salman in his speech yesterday. MBS’ embrace of de facto alliance with Israel, in pursuit of his fanatic hatred of Shia Muslims, is the cornerstone of Trump’s Middle East policy. Haspel’s brief was very simple. She took with her intercept intelligence that purportedly shows massive senior level corruption in the Istanbul Kanal project, and suggested that Erdogan may not find it a good idea if intelligence agencies started to make public all the information they hold. Whether Erdogan held back in his speech yesterday as a result of Haspel’s intervention I do not know. 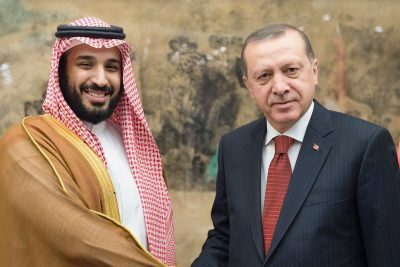 Erdogan may be keeping cards up his sleeve for his own purpose, particularly relating to intercepts of phone and Skype calls from the killers direct to MBS’ office. I have an account of Haspel’s brief from a reliable source, but have not been updated on who she then met, or what the Turks said to her. It does seem very probable, from Trump’s shift in position this morning to indicate MBS may be involved, that Haspel was convinced the Turks have further strong evidence and may well use it. Meantime, the British government maintains throughout that, whatever else happens, British factories will continue to supply bombs to Saudi Arabia to massacre children on school buses and untold numbers of other civilians. Many Tory politicians remain personally in Saudi pockets, with former Defence Minister Michael Fallon revealed today as being amongst them. It is of course extraordinary that Saudi war crimes in Yemen, its military suppression of democracy in Bahrain, its frequent executions of dissidents, human rights defenders, and Shia religious figures, even its arrests of feminists, have had little impact in the West. But the horrible murder of Khashoggi has caught the public imagination and forced western politicians to at least pretend to want to do something about the Saudis whose wealth they crave. I expect any sanctions will be smoke and mirrors. Mohammed Bin Salman is no fool, and he realises that to punish members of his personal security detail who were just following his orders, would put him in the position of Caligula and the Praetorian Guard, and not tend to his long term safety. Possibly people will be reassigned, or there will be brief imprisonments till nobody is looking. If I were a dissident or Shia in Saudi Arabia who bore any kind of physical resemblance to any of the party of murderers, I would get out very quick. With every sympathy for his horrible murder, Khashoggi and his history as a functionary of the brutal Saudi regime should not be whitewashed. Mohammed Bin Salman is directly responsible for his murder, and if there is finally international understanding that he is a dangerous psychopath, that is a good thing. You will forgive me for saying that I explained this back in March whilst the entire mainstream media, awash with Saudi PR cash, was praising him as a great reformer. For the Americans to deploy Gina Haspel gives us a welcome reminder that they are in absolutely no position to moralise. Whatever comes of this will not be “justice”. The truth the leads can reveal is much wider than the narrow question of the murder incident, as I hope this article sketches out. That the fallout derails to some extent the murder machine in Yemen is profoundly to be hoped.